Fleer Showcase picks up where 2012-13 Fleer Retro left off. 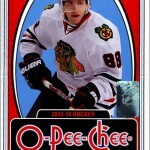 Showcase is your typical mid-range Upper Deck hockey card set, with 100 base cards to collect. 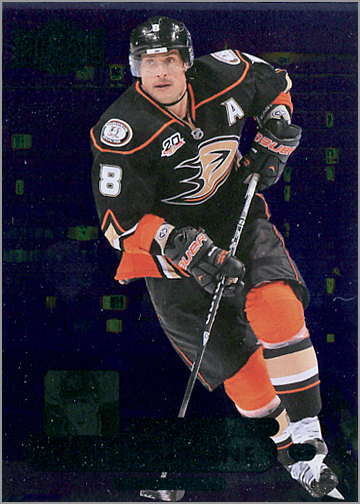 But 2013-14 Fleer Showcase also has inserts designed after 1990s Fleer sets — just like Fleer Retro did two years back, making it a spiritual successor to Retro. 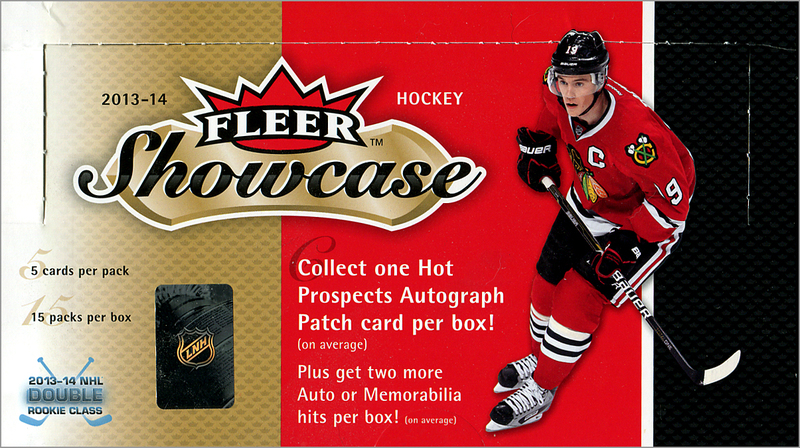 For those who don’t know, the Fleer Showcase brand was used on baseball, football and basketball trading card sets from 2000 until around 2005. This is the first time that the Showcase name has been applied to hockey cards. A box costs around $130 and gets you 15 five-card packs. What goodies could be lurking inside? The 100-card base set is a mix of current stars and retired greats. I got 65 base cards, and none of them were doubles. 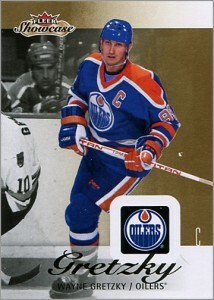 These mid-level sets from Upper Deck are usually run-of-the-mill when it comes to design. 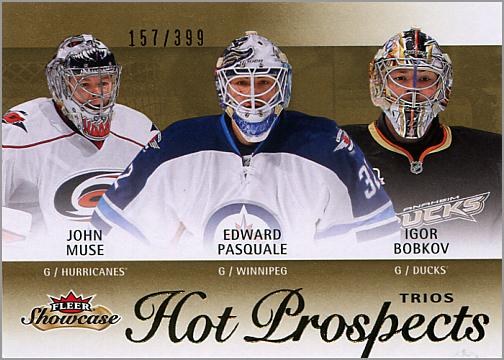 However, 2013-14 Fleer Showcase has a pretty good look to it. The full-color player photo pops off of a background that is half black-and-white photo and half gold stripe. 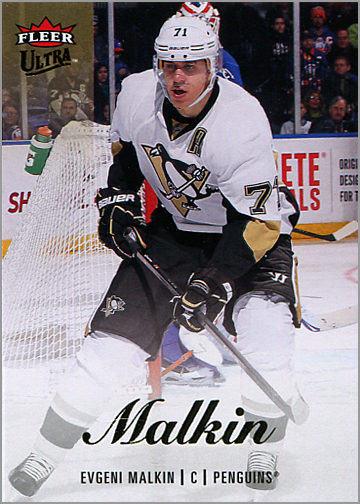 Gold foil lettering spells out the player’s last name — no set would be complete with the obligatory foil nowadays. The only sore spot is the awkward placement of the logo that usually gets in the way. Likewise, the card backs are pretty slick too. See how organized the information is? See how easy it is to read? Sure, there are only five years of statistics, but this looks so much better than the card backs of the Edmonton Oilers set I reviewed earlier this week. 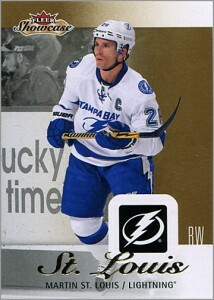 Upper Deck could design the backs of all of their cards like this — except for O-Pee-Chee, which should have complete stats — and I would never complain. Since this season was all about the “Double Rookie Class,” you’d expect lots of rookie cards, right? Well, sort of. Upper Deck decided to double-dip and put two rookies on the same card for some of the rookies. 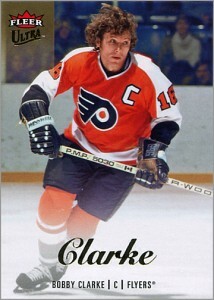 Will Beckett “count” this as an actual rookie card? Probably, since it does feature statistics of both players. 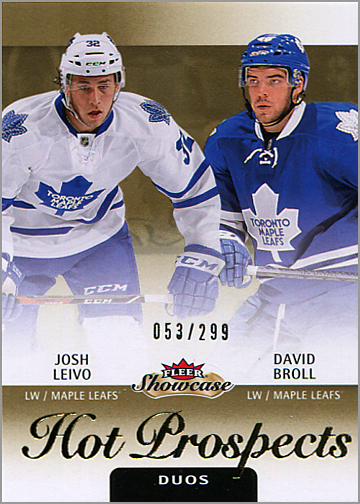 This card features Josh Leivo and David Broll and is numbered 053 / 299. If sticking two guys on one RC wasn’t a novel enough concept for you, how about a card with three guys…from different teams? Can you guess what John Muse, Edward Pasqualle and Igor Bobkov all have in common? 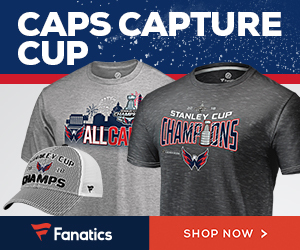 That’s right — they all played in the minors last season, and have yet to appear in an NHL game. Seriously, though,how frustrating could it be for some of these players who aren’t even good enough for their own card…but are good enough for 1/3 of a card? 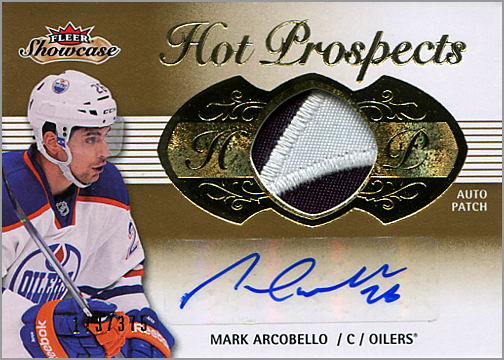 This autographed patch card of Oilers’ center Mark Arcobello is actually part of the set (It’s numbered 152 on the back). The autograph is on a sticker, which is a letdown for a product like this. 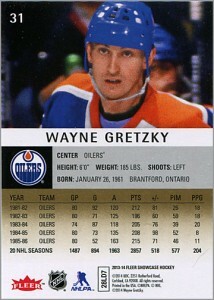 Then again, considering that this guy was a rookie, it is understandable that Upper Deck would use a sticker-graph. But couldn’t they at least work the sticker into the design and/or apply the sticker straight? Like the other RCs, this card is serial numbered. This one is 173 / 375. 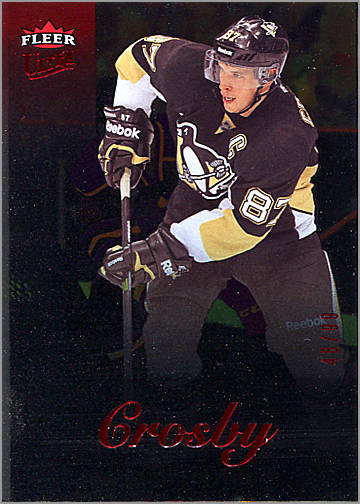 This redemption card is for an autographed patch card of Pittsburgh Penguins rookie Olli Maatta. 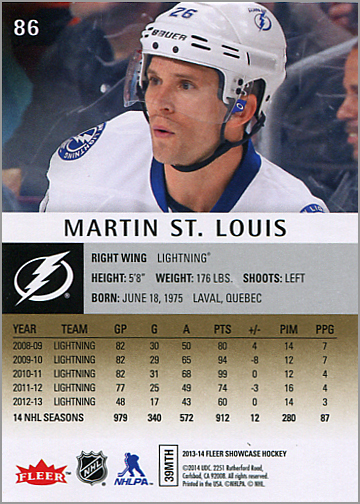 This card will be serial-numbered out of 175. Sure, I wish the swatch was red, or blue, or red and blue. Nonetheless, it is still a jersey card of a great player. 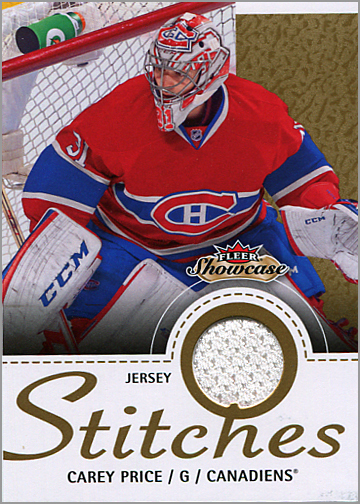 Although not a part of the actual set, the gold band on the right gives some continuity between the Jersey Stitches cards and the base cards. I’m not sure what year these Fleer Ultra inserts are supposed to resemble, if any, but I got Evgeni Malkin and Bobby Clarke. There are also 30 Fleer Ultra Rookie cards. 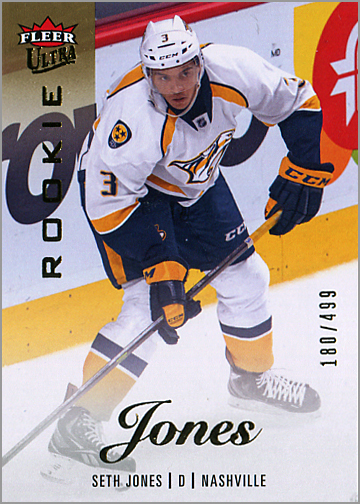 I’m guessing these are one per box, as this Seth Jones card was the only Ultra RC I got. It is serial numbered 180 / 499. What? 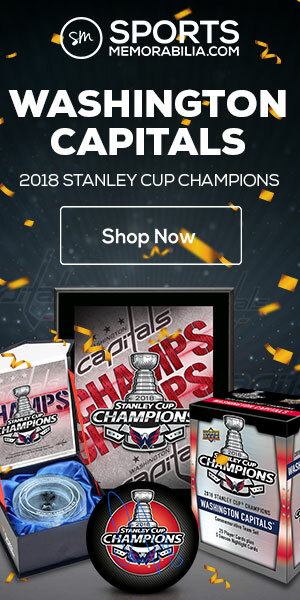 You don’t remember the Skybox Premium hockey set from the 1990s? That’s because there wasn’t one. 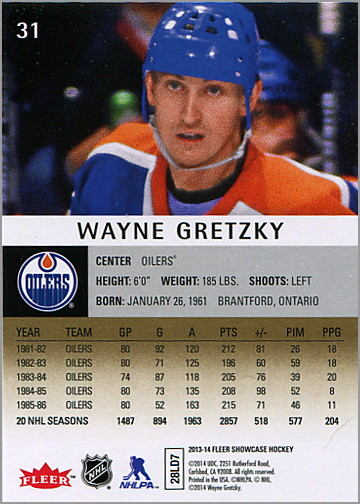 This card is based on the design of the 1993 Skybox Premium Baseball card set, so it makes about as much sense as putting a baseball player on a 1971-72 hockey card. What’s next, Comic Ball inserts? Sigh. 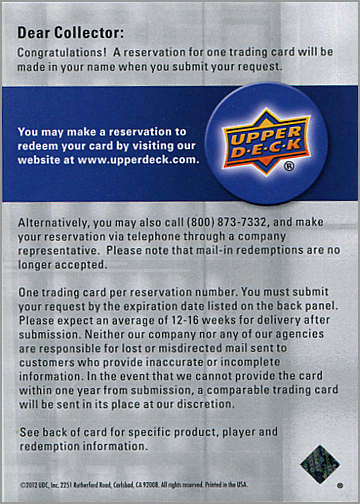 I never thought I’d say it, but I’d much rather have the Metal Universe cards as inserts than Skybox Premium, or some of the silly ones from Fleer Retro two years back, like Noyz Boyz or Intimidation Nation. The Metal Universe cards are shiny and very colorful, but do not scan well. 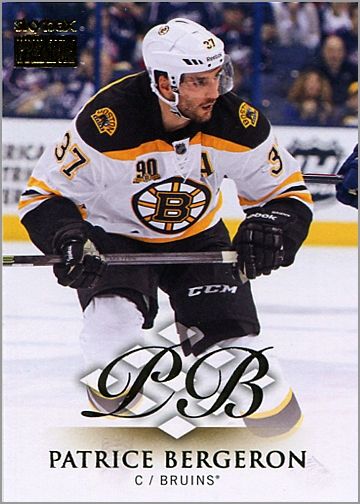 What I like about 2013-14 Fleer Showcase: Above average base card design. Easy to read stats and info on the back. 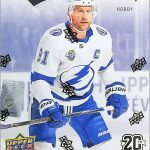 Three hits per box. Retro inserts like Fleer Ultra and Metal Universe. Lots of variety in the inserts. Getting a serial-numbered autographed jersey patch rookie card (and a second one via redemption). 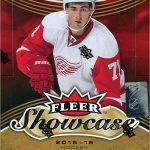 Really, Fleer Showcase could have been called Fleer Retro, and I would have been fine with that. The base set design is nice, and I still can’t get over the elegant simplicity of the card backs. The retro-esque inserts are fun, but I wish you got more of them in a box. Still, the variety you get makes for an interesting break, and you might get a auto/patch card of a notable rookie. Did very well on this box! 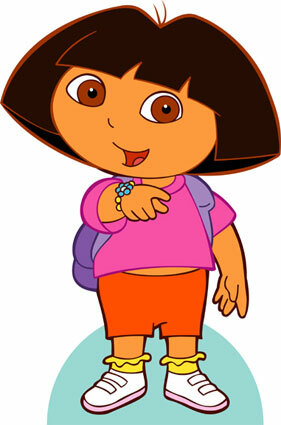 Arcobello would be a keeper for me.